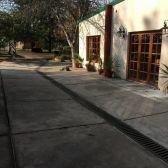 The property is located at Calle Las Vírgenes, Las Paredes District, Department of San Rafael, province of Mendoza, just 5 miles from the center of the city with hotels, casinos, restaurants, nightclubs and a gorgeous gathering plaza where concerts take place. La Serena is also located just 35 miles from the ski slopes of the Andes Mountains and surrounded by Vineyards and Wineries. ★ The club complex of cabins sits on 1.8 acres or 7,150 square meters and has 4, fully equipped cabins, for 2, 4, 5, and 7 people. 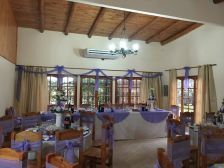 The cabins and main house have furniture, electric appliances, heaters and air conditioners, direct T.V., Internet and WiFi. ★ CABIN 1: for 5 people, 80 square meters/ 861 square feet with 1 bedroom, living-dining room, kitchen, cupboards and wooden table, with granite surface table. The bathroom is big. ★ CABIN 2: for 7 people, 100 square meters/ 1,076 square feet, with 2 bedrooms, kitchen, one and one half bathrooms. ★ CABIN 3: for 4 people, 80 square meters/ 861 square feet, with 1 bedroom, kitchen, one and one half bathrooms. ★ CABIN 4: for 2 people, 32 square meters/ 344 square foot studio/loft. This cabin has a kitchen and a bathroom. ★ All cabins have a grill outside, for preparation of roasts. 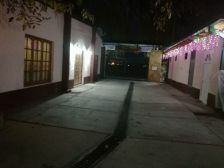 ★ There is a Garage of 60 square meters, closed for two cars and outside outdoor space, covered for parking 10 vehicles. ★ Swimming pool of 10 X 5 m/32 x 16 feet, completely fenced with iron railings for child protection, two bathrooms, showers and tables with granite counter tops. 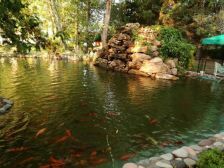 ★ A guest favorite is an artificial lake of 600 square meters with two waterfalls, a fountain, iron bridge, completely built with travertine stone. There are 250 KOI carp fish living in the lake. ★ A restaurant of 120 m/1,291 square feet, with capacity for 80 people, fully equipped. ★ One main entrance and two more auxiliary, with another entrance to the bottom of the complex for heavy vehicles. 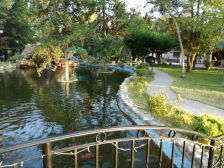 ★ It also has the complex with three park areas, numerous ancient trees: poplars, pines and palm trees, offering very good views and precise and necessary shadows. ★ The main house is 120 square meters/ 1,291.67 square feet with two bedrooms, two bathrooms, living room and kitchen and a wide, spacious gallery. ★ There is a very wide gallery annexed throughout the main house, with an area of ​​approximately 30 square meters. 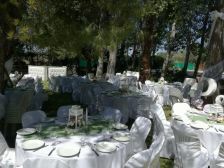 There is an open space for outdoor events with tents, 4,844 square feet in size. 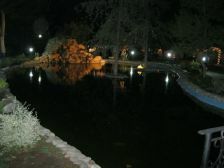 The property has natural gas, potable water, three-phase electric current, water well for irrigation and maintenance of the lake and swimming pool. Great complex for a large family gathering or good income.